Long-time followers of the ICH Blog will have read here about the largely-vanished tradition of lych-gates in Newfoundland (you can read our occasional paper on lych-gates here). A lych-gate, succinctly, is a “covered wooden gateway with open sides at the entrance to a churchyard, providing a resting place for a coffin” (Fleming et al. 277). 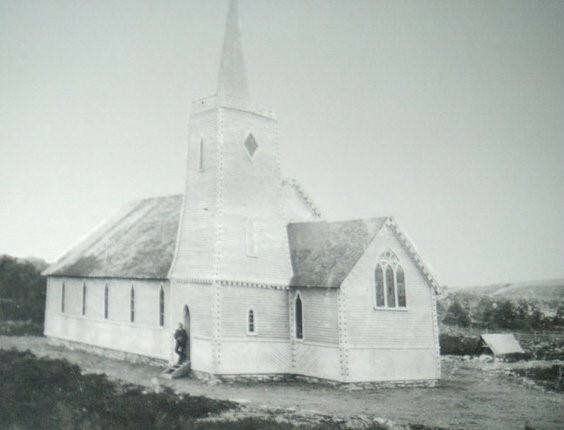 In Newfoundland, they seem to have been exclusively used by Anglican congregations, and in our earlier research, we found three: one restored in Bonavista, one original in Corner Brook, and one demolished at the Anglican Cemetery on Forest Road in St. John's (you can see a picture of that one here). H.T. asks why the gate at the Church of England Cemetery at Bonavista is called the Lych Gate. The word Lych or Lich is Anglo-Saxon, and means a corpse. Hence a Lych Gate is a churchyard gate, with a roof over it, under which, on the occasion of a funeral, the corpse and its bearers may await the coming of the officiating minister. A properly equipped Lych Gate has a long seat on each side, on which the bearers may sit, and a stone called the Lych-Stone in the middle of the path, under the roof, on which the coffin may be placed. If the person has died of an infectious disease, and the body is not to be taken into the church, a part of the Burial Service is sometimes said at the Lych-Gate. Built about three hundred yards from the main road, and approached by a good broad road near by—the free labor of the people—its position is seen to be most excellent. As the visitor leaves the main road for the church he passes beneath a lichgate, bearing the inscription, '« Holiness to the Lord," put there to remind him of the reverence due to the place where it has vouchsafed the Lord to place His name. On St. Peter's Day from each of the four corners of the tower floated a flag in honor of the birthday of the church, and as a welcome to His Lordship the Bishop, whilst for the same reason the lichgate formed the base of a triumphal arch, made of the fir and spruce. There you have it, another lych gate, the fourth identified for the province. This structure no longer exists, and was possibly removed when the church was rebuilt. "Answers to Correspondents." Evening Telegram (St. John's, N.L. ), 1922-08-05. P8. Fleming, John, Hugh Honour, and Nikolaus Pevsner. The Penguin Dictionary of Architecture. Fourth Edition. London: Penguin, 1991. "The Lord Bishop of Newfoundland at Heart's Content." Evening Telegram (St. John's, N.L. ), 1886-07-07. P4.